Adapted from Japanese anime, the original series ran in 1984-85 and featured four guys and a princess who'd pilot the lions and protect the universe from monsters. The new series revolves around five Earth teenagers: Keith (voiced by Steven Yeun), Lance (Jeremy Shada), Hunk (Tyler Labine), Pidge (Bex Taylor-Klaus) and Shiro (Josh Keaton). They're thrown into an intergalactic battle against an evil alien force led by King Zarkon. “We’re trying to keep as much of that classic feel to it as we can, because ultimately we have huge amounts of nostalgia for (the original) show,” says co-executive producer Lauren Montgomery. The 13 22-minute episodes become available June 10. 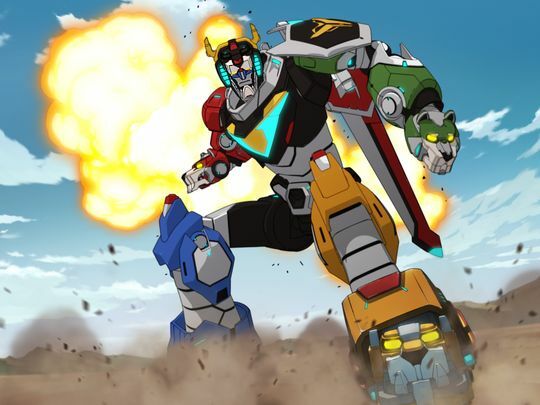 Executive producer Joaquim Dos Santos (The Legend of Korra, Justice League) and the creative team considered a more serious military approach but ultimately went the opposite way, preserving a more nostalgic feel, "a true sense of epic adventure" with "the campy nature of five lions that become a giant robot."